Is the age at which kids get cell phones getting younger? In the past few months we’ve been getting some questions about the age at which teens generally get cell phones. 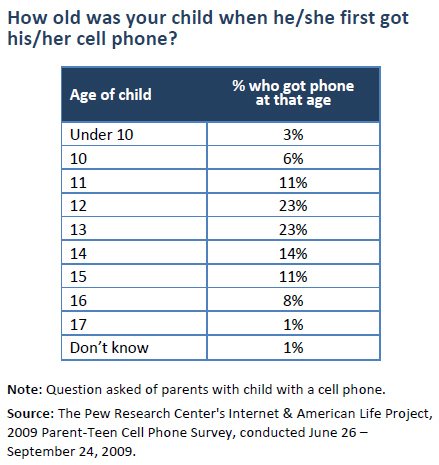 In our Sept 2009 survey, we asked parents the question about how old their child was when they first got their cell phone – which we reported in the Teens and Mobile Phones report, but which was buried among all those other pages of data nuggets. The bulk of teens are 12 or 13 when they get their first cell phone – but remember this applies to teens who are 17 now and got their phones 5 years ago, as well as current 13 year olds who have had a phone for 6 months. So this gives us the average for all teens across the past 5 or so years, rather than a full understanding of how adoption of cell phones by teens may be changing over time. And this doesn’t include the about 25% of teens who don’t have cell phones. To more fully understand changes in age of cell phone adoption over time, we need to break out the data by age. Younger teens were slightly more likely to get cell phones at younger ages than older teens. None of our 17 year olds got cell phones when they were 10 or younger, while 28% of 12 year olds did. There is also clearly a point in time roughly between two and four years ago when a lot kids of all ages got their first cell phone. 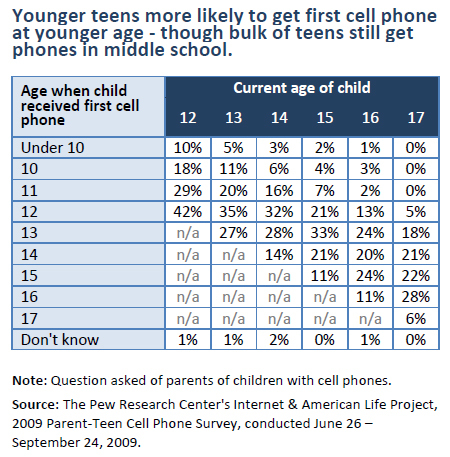 Still, the bulk of kids across time are getting cell phones at ages 12 and 13 – right as they transition to middle school.